Stop Looking At The Astronomical Kid's Mom : Blog Of The Nation Willow Smith inspired young girls with her hit, "Whip My Hair." Now, the Astronomical Kid (nee Brian Bradley) is rallying for black women to have a similar moment -- specifically, his mom. Check out "Stop Looking At My Mom." Young Willow Smith has received quite a lot of glowing press -- and rightfully so, in my estimation -- for her hit song "Whip My Hair." It's a confident, fun pop song by a girl who's all of ten-years-old. And paired as it was, coincidentally, with the release of Sesame Street's "I Love My Hair," it marked a moment one blogger called "The Best Week Ever For Black Girls." And now, the Astronomical Kid (nee Brian Bradley) is rallying for black women to have a similar moment -- specifically, his mom. 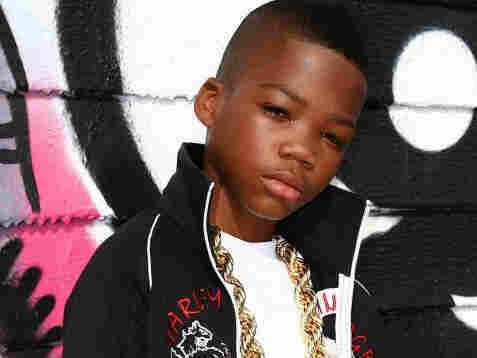 Astro, as he's know to friends and fans, is a 14-year-old emcee from New York City, and his song, "Stop Looking At My Mom," went viral in October, right about when Smith's song did. So maybe it's time to take another look at the Astronomical Kid. In the video, Astro and his friends take on various grown men who ogle and chat up their moms. He told the Daily Mail that he figured writing rhymes was the best way to handle his frustration with guys who hit on his mom. Sometimes I gotta turn around and give them the evil eye. Mentally, I'm a grown man. Height, I'm a kid. Good call. And his mom's proud of him, too. I don't think that any child wants anyone catcalling their mother. What he is trying to say is, "This is my mom, have some respect, not only for her, but for me, too". I think it's a good message. Incidentally, the Astronomical Kid has also recorded a remix of "Whip My Hair," which you can find here.